Clear aligners are an alternative to traditional braces and are designed to help guide teeth into their proper position. Similar to braces, clear aligners use a gradual force to control tooth movement, but without metal wires or brackets. The aligners are made of a strong plastic material and are fabricated to fit each individual's mouth. If a series of aligners are needed, each aligner moves the teeth in increments until the desired movement is achieved. Aligners are worn for at least 20 hours a day to reach the desired maximum effectiveness. 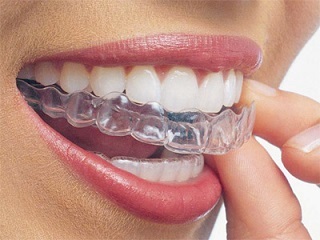 Each aligner is worn for 3 weeks before changing to the next one. The length of treatment with aligners depends upon the severity of each case. Typically, aligner treatment can be as short as 3 weeks or as long as 6 months. Overall, aligners offer a much shorter treatment than traditional braces. Clear aligners are a great alternative for patients who want a straighter smile, but do not want to wear traditional metal braces. Also, aligners are beneficial for patients with previous orthodontic treatment that want to make minor corrections to their smile. - Clear aligners are removable so it is easier for you to brush and floss after meals. - Clear aligners are easier to keep clean. - Clear aligners are comfortable and less likely to irritate your gums and cheeks. - Clear aligners can prevent tooth wear from grinding.